Get Fired Up, Notched-Eared Pichu (もえよ　ギザみみピチュー！) is the fourth ending theme to Pocket Monsters Diamond & Pearl. Kagami no mae de muchuu! Ubu no mi ikutsu o-kuchi ni hairu? Dare ka ni waraware shokkuu? Sono ato naisu tu mii chuu! Ki ga tsukya koko dokoo? On'na no ko nanda mon! Giza moe! Giza kawayusu na! Kotchi ni oide yo yahhoo! Ki ni naru ko nanda mon! Ra ra ra ra ra ran raran! Have. You. Heard? Those. Newest rumors? That Pokemon. Everyone's. Curious about. Hah! Hah! It's bursting onto the scene. Hah! Hah! It even fascinates itself. It loves what it sees in the mirror! 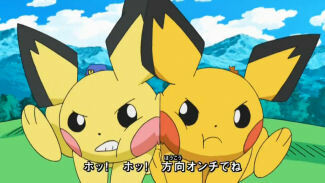 It wants to be stronger, that Notched-Eared Pichu! Hah! Hah! It's running toward that goal. Don't forget that it has one problem! It comes to and asks "where am I?" This lost kid looks around frantically. Tears start to stream like a river. Get Fired Up! Super adorable!